Before our recent trip back to New York City, I hopped online to check out what would be going on in town that week. I always like to try get a feel for what is happening before committing to too many things in the city that never sleeps. While I was looking around, I received a tweet from The Brooklyn Kitchen mentioning a couple of up and coming classes — one of which was happening the same week I would be in town. Score! 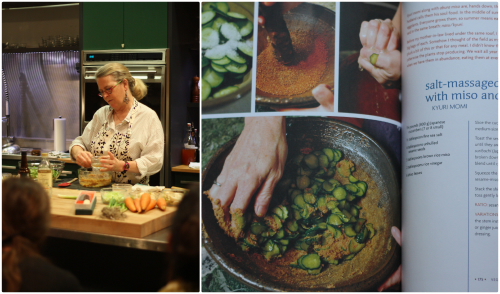 After heading over to the Etsy offices to pick Mary up on Thursday evening, we went over to The Brooklyn Kitchen, excited to meet Nancy Singleton Hachisu — author of Japanese Farm Food. The Brooklyn Kitchen is not a new destination for me as I visit it at least once every time I am in the city. It's a favorite stop on my list not only because of all of their amazing kitchen finds but also because it houses The Meat Hook, an amazing butcher shop of which I am always picking up hand crafted sausages to bring home. 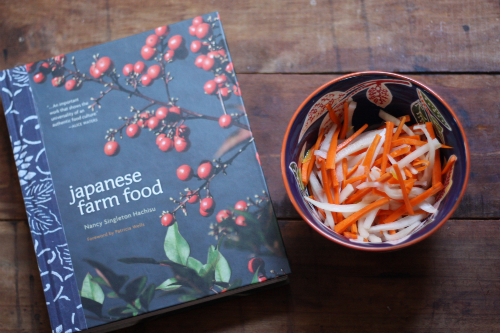 Nancy was soft spoken and confident in describing her reason for going to Japan (being the food) but she fell in love with an organic farmer, Tadaaki Hachisu, who proved to love food as much as she did and would go to great lengths to grow it or find it. 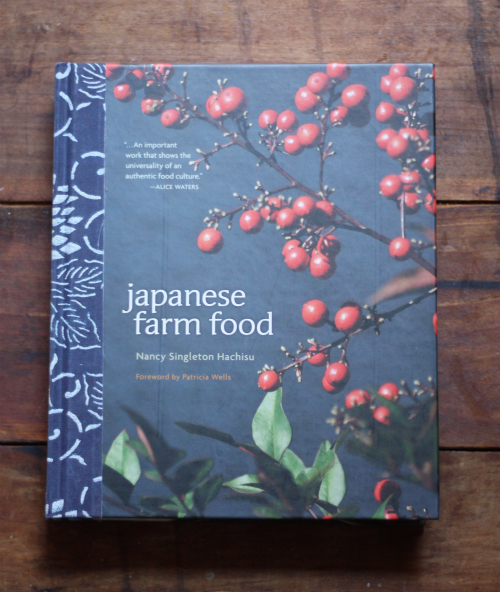 Using only the finest ingredients, including making her own miso paste, her cooking exemplifies the beauty of this book through simple, local, and minimal high quality ingredients — creating a farm-to-table bible of sorts. 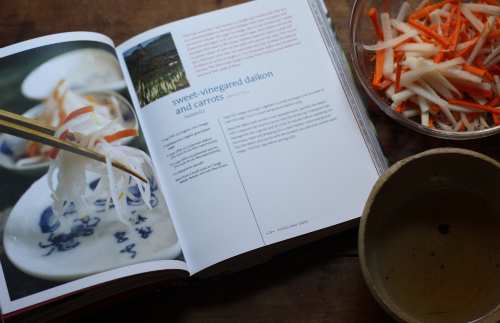 While reading through and admiring the beautiful photography in this book (shot almost exclusively on their farm in Japan) I came across a simple sweet-vinegared daikon and carrots recipe, or Namasu, of which I had all of the ingredients for — including a daikon radish from my recent daikon radish chips post. With the holidays are upon us here in North America it's funny to me that this dish is generally served during the holidays in Japan and acts as digestive for those who tend to eat too much. 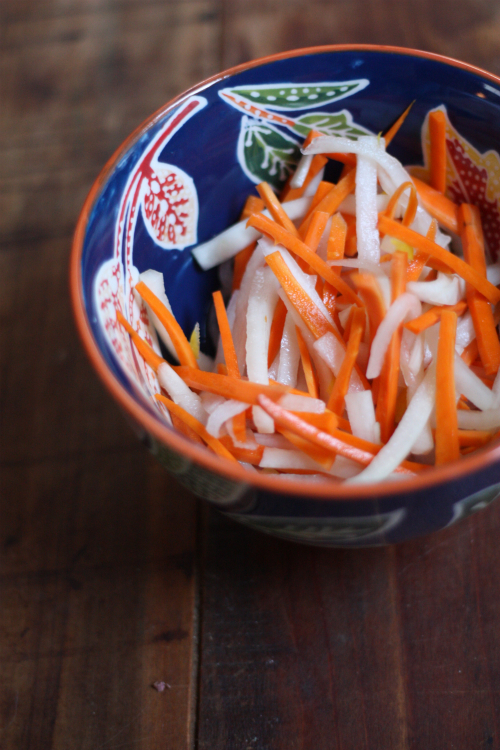 As with the theme of the book, both daikon radishes and carrots are in all of their glory right now! 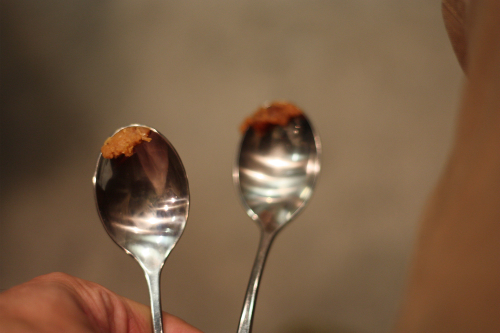 I felt so lucky to have met Nancy and have a few moments in the end just to briefly talk with her about sourcing and utilizing local ingredients, whether in Japan or in Richmond, Virginia. The beauty and stories in this book are worth purchasing for yourself or as a gift for someone else this season. 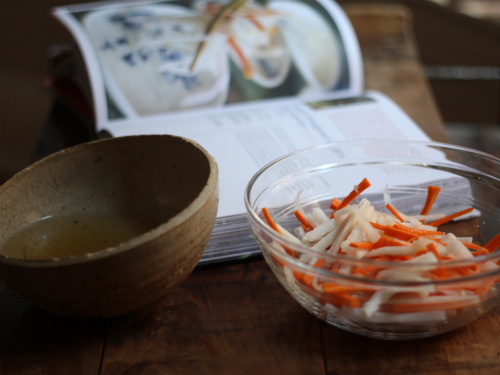 Oh by the way, you might even find a recipe or two that you cannot live without! Wow, this book looks amazing! Thanks for the heads up. :) This is making me miss Brooklyn something fierce too. 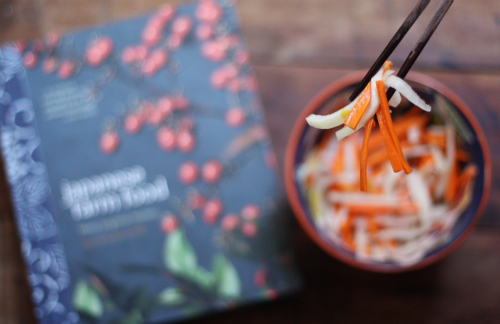 It really is an amazing cookbook! I am sure Brooklyn misses you!